Maybe the alarm bells should have started ringing when it was announced last spring that Hazel McCallion, the ageless urban icon who spent 36 years as mayor of Mississauga and is still a political force at the ripened age of 97, was joining the Doug Ford-For-Premier team as a consultant in last June’s provincial election. At first glance, this seemed an unholy alliance – the alt-right bullyboy and the lifelong conservative-leaning Liberal savant. If you scratch the surface (and not too deeply) you’ll find a perfect pairing. Both bristle at following time-worn political norms. Both have (how shall we delicately put this…) autocratic tendencies. Both share an in-bred contempt for big government, especially the dreaded multiplication of services. Both found cozy bedfellows inside the development industry. In McCallion’s case, so much so that she was almost removed from office twice for playing footsie with the building industry – the last time in 2009, at the behest of her son Peter. His company wanted to build a $1.6 billion hotel and convention centre in downtown Mississauga. When McCallion worked behind the scenes to get the deal done, council, tired of her shenanigans with real estate players and developers, called for a judicial inquiry. She was spared removal from office but slammed by the judge for her “real and apparent conflict of interest.” It was the second time in her mayoral career that she avoided losing her job after a judge found her in a conflict of interest over a real estate arrangement involving a family member. Ford is still a work in progress. During his run for premier, a leaked video surfaced with him singing the praises of his developer friends and saying, “I’m with you,” promising to open one of the world’s largest protected greenbelts to their bulldozers. It’s still unclear if Ford hates big government because it imposes too many restrictions on growth, like the Liberal initiative in 2005-06 (Places to Grow) that stopped the massive urban sprawl eating up land at an alarming rate, and Greenbelt legislation that placed a metaphorical wall around our most pristine and undeveloped land. Ford hated the supersized Toronto City Council so much that upon election as premier, he immediately sliced it in half – a bold and bloody stroke that would have made Macbeth proud. His action got the attention of voters and municipalities right across the province. Some (the alt-right) sang the hallelujah chorus, while others (the alt-left) said, oh no, here we go again – it’s Mike Harris 2.0. McCallion (Lady Macbeth) has fought a career-long full-frontal action against over-government. She tried her best to remove Mississauga from Peel Region and was heard during her time in office to cry, “out spot, out.” But ultimately, under her limited power within the Municipal Act, she failed. We all know that the Madame X of municipal government doesn’t like to lose. Hazel’s argument was this: Why should Mississauga taxpayers pay for two types of road systems, one regional, another municipal? The pint-sized dynamo was unafraid to list off all the other peccadilloes that stymied her city’s independence movement. Regionalization was like the financial advisor who was ruining your portfolio because, regardless of how markets performed, he would always extract his exorbitant fees. Now we have some context to news this past week that Ford has ordered a review of regional government in the province. After holding the same role for the previous premier, Kathleen Wynne, McCallion might be the first person in Ontario’s history to convince two consecutive premiers, from warring parties, to adopt them as consigliere. Developers (especially those in the housing market) must have danced a lively jig, while environmentalists are cringing, and overburdened taxpayers might wonder why the heck Ford would give good money to a woman who hardly needs another paycheque. And couldn’t she have offered her services for a proverbial buck, since she’s more than financially fixed? At second glance, this really is an unholy alliance. What the Macbeths promise to do to this province might cost us billions to undo once he and she are written about in the future. While eight regions, under Ford’s recently announced plan to shuffle the municipal structure, are being targeted for study, let’s first focus on one, Peel, in existence since 1974, when William Davis (Brampton Billy), was premier of the province and brought together disparate communities like Streetsville, Malton and Lakeview, et al. to create Mississauga, and Chinguacousy, Bramalea, Huttonville, et al. to create Brampton. He then affixed the bucolic sprawling rural Township of Caledon (larger than Toronto) to its northern boundary, and voila, Peel Region. Davis, like McCallion, is still an ageless political player, although compared to her, a mere babe at 89. He was last seen playing Machiavelli by endorsing Patrick Brown’s bid to win the mayorship, after he had quietly endorsed the other frontrunner, Linda Jeffrey, four years prior. While both icons turned into kingmakers in their later years, the irony is that McCallion is trying to undo what Davis did to reorganize the governance model in 1974. Any chat with Davis on the subject of McCallion always begins with his good-natured quip about how he created this Mississauga monster. While some historians think the infamous Mississauga Train Derailment (1979) was the making of her, Davis said she might still be the mayor of the tiny hamlet of Streetsville if it wasn’t for regionalization. McCallion and Ford also share something else. They leapfrogged into politics from the world of business – Hazel from Canadian Kellogg, a building firm, and Ford from his daddy’s labelling company. They find it hard to abide the restrictions placed on business, in its pursuit of the only noble prize, eschewing well-worn rules of conduct that protect the public. Ford, while a city councillor, was censured by the integrity commissioner, for his lack of integrity in using his position to benefit companies that had done business with his family’s printing firm. Maybe that’s why the building sector picked clean the carcass in Mississauga during McCallion’s time as chief executive. She often said she “would do cartwheels” to bring business to her city. So yes, picture the darkened shadow of McCallion creeping across the page as Ford put his signature on papers beginning the regional review. A worst-case scenario (elimination) could have potentially devastating consequences for Brampton (more on that later), and the history of Ford-McCallion suggests they will be hell-bent on making that happen. First, here are some responses to the news of the regional governance review. While McCallion wasn’t invited to the Greater Toronto and Hamilton Association of Mayors’ confab at John Tory’s office on Tuesday, it’s clear her fingerprints were all over this initiative. And, if mayors who favour regional government think Ford will temper his tendencies to act harshly, or won't consult only with his consultants, Tory still has fresh knife wounds he’d like to show from Ford’s backstabbing attack on Toronto Council last summer. Tory said he only wished Toronto was given “the same opportunity” to be consulted as it appears other municipalities now have. “We’d like to think the lesson was learned from that,” he said. Perhaps the lesson learned is that hiring consultants to create a document that will either be white-washed or ignored is the Ford-McCallion way, pure window dressing for what promises to be a chance at more political bloodletting. He and his elder partner might have already decided what’s best for taxpayers (developers?) 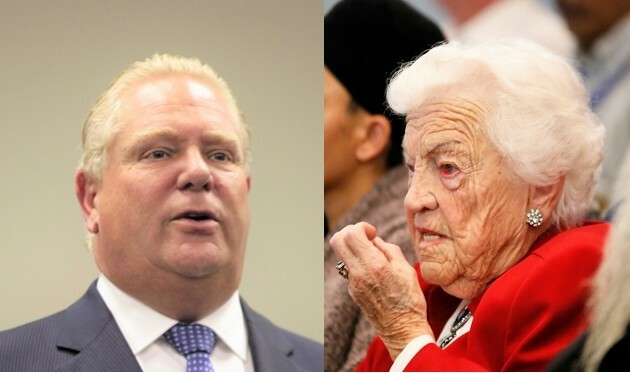 and Ford will use McCallion's grandmotherly visage and homespun reputation as a defender of the beleaguered taxpayer as cover while he drives in the sword. This is, of course, a cynical view, and not shared by the two distinguished consultants hired to make recommendations, both with deep ties to regional government. Ken Seiling is one of the two provincially appointed advisers tasked with heading up the regional review. He is a comely figure with deep knowledge of the municipal governance model. He said to reporters that nothing lasts forever, and all government agencies are subject to change and renewal. After 33 years as chair of Waterloo Region, the Elmira native brings no preconceptions into what the review will conclude. He’s joined by Michael Fenn, a deputy minister under three Ontario premiers, and former chief administrative officer in Hamilton and Burlington. The review will decipher the pros and cons of the province’s eight regional governments and report back in early summer. Ford couldn’t have picked wiser agents to give him guidance. If he follows it, is another question. Both are noted for their independence of thought, and Fenn was one of the early politicos who pushed the Greenbelt and Places to Grow initiatives – both burrs under the saddle of the Ford-McCallion tandem. Places to Grow (to stop suburban sprawl and encourage development that grows up, not out) and the Greenbelt (which puts a governor on growth into the leafy green lands that surround the sprawling concrete of the GTHA) have come under attack by Ford in recent months as articulated in the proposed Bill 66, Restoring Ontario’s Competitive Act, released just before the holiday season. It suggests the Ford government would be more than okay with developers poaching from these protected lands. It was once thought Places to Grow was targeted directly at McCallion and her northern champion of unfettered development, Brampton Mayor Susan Fennell. Under previous Liberal governments, Brampton was warned that its rate of subdivision construction was twice what the province recommended and not sustainable. But Fennell, who received millions in private fundraising contributions from developers, carried on the sprawling tradition of her predecessor, Peter Robertson. Under their distracted watch, developers who made fortunes pushed the city’s population from about 230,000 in 1990, the year before Robertson took office, to almost 600,000 in 2015, the year after Fennell’s 14-year reign ended. McCallion, who had written the playbook on how to cozy up with developers, launching her mayor’s gala long before Fennell started accepting donations while lands were bulldozed for homes, oversaw an equally impressive population explosion. Mississauga’s hyperactivity saw its numbers go from about 280,000 residents when she took office in 1978 to about 720,000 in 2015, the year after she stepped down. It was telling that plans for the anti-sprawl legislation were rolled out in Mississauga in 2005. Ford is a disciple of Harris, the former premier, who preached from the alt-right playbook of "build it and they will come." The leader of the ‘Common Sense Revolution’ came to office in the 1990s, hard on the heels of the unpopular term of Bob Rae and the New Democratic Party, which drove up the debt while introducing a series of economically crippling personal and business tax schemes that failed. Harris wanted efficiencies. Sound familiar? He forced the amalgamation of the six municipalities that made up Metropolitan Toronto, as well as joining together school boards and shuffled the deck on other service providers. Toronto is still reeling from this unpopular move, and his mantra of “finding efficiencies” that would lead to mammoth cost savings for the public never materialized. Further moves to trim government, including re-doing the governance model in cities like Hamilton and Ottawa, only led to more resentment. Meanwhile, regional government has been around so long it has created a tangled web of infrastructure and services, including public health, police, water, sewage, garbage pickup, public housing, Ontario Works, ambulatory care and others that will be difficult to undo. McCallion asked the province to begin the transition to a separated city in advance of the 2006 election. A Citizens’ Task Force recommended regional government be phased out within five years, and a chartered accountancy firm reported that a separate city would save taxpayers $32 million a year. It spawned a campaign called ‘One City One Voice’ and heightened the efforts to secede. The gutting of Toronto Council and the elimination of public voting on a new regional chair in Peel and other jurisdictions around the province are clear signs that Ford is farther down the road in his plans to slash and burn government institutions perceived as wasteful. Because many of the regional services in Peel (especially water and sewage treatment) are headquartered in Mississauga, it remains unclear how dismantling the region would impact Canada’s ninth largest city. Just splitting up the regional police force would prove troubling and costly. There would have to be two training centres, two headquarters, two sets of civilian staff, intelligence gathering facilities and so on. The integration of policing and other services put former regional chair Emil Kolb in the uncomfortable position of trying to keep the model relevant while McCallion was trying to tear it down, and this was done by putting emphasis on the growth of public utilities, including new water and sewage treatment plants in south Mississauga. Other regional services were supposed to seal the bond between the three municipalities. But Ford and McCallion are now determined to get their way. The Pointer reported this week that Ford’s government is even sticking its nose into possible future utility charges from regions. While a 6.5 percent increase in water and wastewater charges for 2019 has been proposed in Peel, an additional 73 percent might also be on the books if Ford’s plan to eliminate development charges collected by the region from builders is approved. That’s more than $35,000 for each family home that developers currently must pay the region for constructing roads, sewers, water mains and other infrastructure needed to service new buildings and subdivisions. It will be money that stays in the pockets of developers and comes out of the pockets of existing homeowners. If the development charges are eliminated it will definitely have “wide-ranging” impacts on the region, said David Szwarc, Peel’s chief administrative officer. McCallion has always recoiled at Mississauga subsidizing services for the rich gentleman farmers of Caledon, and that goes double for Brampton. That’s why the concept of a super municipality, a City of Peel, mentioned in media reports this week, is unlikely to happen. The Pointer received assurance from one major player — it will not happen. If McCallion’s track record is any indication, they are right. She wants Mississauga out, not partnering with anyone. She was a cheerleader for the Places to Grow legislation when it was unveiled, and said it was her come-to-God moment when her city ditched its backward development model to follow the new directives. But she quickly turned on the Liberals, becoming one of the biggest backers of the building industry’s initiative to undermine the land-protecting measures brought in by Wynne. Anyone unfamiliar with McCallion, fooled by the wrinkles, grey hair and diminutive frame, probably finds her Machiavellian maneuvering hard to believe. While working for Wynne as the former premier’s special advisor, the Liberals were about to roll out a series of legislative changes to strengthen Greenbelt protection and curb sprawl, especially in the suburbs, where new density requirements would pretty much prevent new residential construction, other than compact, vertical development. The builders of single-family homes, who had collectively made billions during the GTA’s four-decade suburban explosion, thanks in no small part to McCallion, were up in arms. In 2016, in tandem with the building industry’s efforts, she sent an open report to Wynne and did what she loves to do, use the media to her advantage. She went to them, claiming the moves would drive already high housing prices even higher, as the lack of supply created by the curtailing of new home construction would make the GTA unaffordable. It was the exact same message being simultaneously spread by the lobby group that represents new-home builders. There was one problem with McCallion’s sloppy plan to undermine the premier who had hired her. She claimed her sentiment was “overwhelmingly” shared by mayors and other municipal politicians across the Greater Toronto and Hamilton Area, with whom she had attended a meeting to discuss Wynne’s new coordinated plan to slow down sprawl. And that’s when her tenuous relationship with the truth, as called out by two judges, bit her once again. Prominent mayors and other municipal leaders came out in force, stating they could not support McCallion’s position, as they set the record straight about the meeting she referred to in her report to the premier. Many publicly stated that sprawl needs to be curbed, it is deeply harming the GTA economy, the Greenbelt must be protected and there is more than enough available land to meet the demands of those in the property market. McCallion, realizing her latest deception had backfired, went quiet. It wasn’t until he was elected that fixing those finances included handing her a generous $150,000 per annum. It’s clear the Wynne-McCallion split also came over the Greenbelt issue. Wynne insisted this legacy had to stay as is, while McCallion wanted it open to bulldozers, builders and real estate agents. The head of the province’s municipalities thinks housing is a top priority and building up the supply might mean giving developers the tools to get their hands-on Greenbelt lands. This seems odd, since giant swaths of land, especially in Brampton, are still available for building. This is something Brown made clear in his inaugural address at the Rose Theatre in December. He rejects outright the idea that an army of developers will one day move in and plunder the Greenbelt. Crombie said McCallion “is an excellent choice” to advise Ford and Clark. “I know Hazel understands Mississauga’s issues and positions and will be a strong advocate for our city and the municipal sector,” Crombie told the Toronto Star. That glowing praise seems curiously at odds with the growing schism that has developed between the two over the past few years and manifested itself during the vote for Peel’s new regional chairman Nando Iannicca, the former Mississauga councillor. McCallion backed former Liberal finance minister Charles Sousa. Crombie has been the most progressive political voice in Peel since she took over for McCallion. The successor was the driving force to end police carding, standing up against a chief hell bent on defending the destructive practice, while McCallion’s friends that she put on the police board had allowed a succession of chiefs to do whatever they wanted. Crombie has been a supporter of anti-sprawl legislation and has backed Greenbelt protection. She has also reversed years of bad planning under McCallion to create an urban agenda for the country’s sixth largest city. If it does, Places to Grow and the Greenbelt legislation might be toast. Brown has stated he does not want that and that he does not support opportunities in the proposed Bill 66 that would allow development in the Greenbelt. One gets the impression a new era of politicians is growing tired with McCallion’s predictable style of politics and her failing idea of city building. Even if they might respect much of what she’s accomplished. Painting the world in broad, conservative brushstrokes is the way Ford does business. Bill 66 is a warning to lovers of the environment that he has something bad up his sleeve. It has the smell of those who know the evisceration of anything deemed green leads to a different type of green for them. And lots of it. There’s lots of pushback from the public, and a meeting is scheduled close to Brampton on Feb. 7 at the Glen Williams Town Hall (near Georgetown). The Green Party of Ontario, its Canadian counterpart, Environmental Defence Canada, the University of Guelph, and cities like Barrie, Nipissing and others are fighting Ford. Robert Eisenberg of Environmental Defence has been all over social media trying to rally support to kill Bill 66. The official hiring of McCallion by Ford will no doubt alarm many who saw her as a champion of yesteryear, when industrial development and American-style subdivision projects were allowed to run amok in the province. There are some who now suggest she and Ford were made for each other. He has bullied his way through his first few months in charge of the province by cutting Toronto Council and getting nasty by axing university funding to cities like Brampton. And now, he’s gone after students directly, with cuts to Ontario’s popular post-secondary loan program. After her own giveaways to developers, it’s puzzling that the woman long called The Queen of Sprawl, with her dictatorial rule over Mississauga, found favour in the Liberal party (not that Wynne and her party colleagues didn’t benefit handsomely from donations by the building industry, too). But McCallion’s newfound home inside Queen’s Park is a much better fit. The Ford-McCallion tag-team portends trouble for lovers of green lands, or the good things that arise out of regional government – like a team approach to building and the sharing of services under one roof. The enthusiastic support Brown lends to the news that one of his political mentors, McCallion, is bringing her expertise to the Ford team, is unjustified. She and Ford have displayed their true colours time and again when it comes to servicing the needs of their development friends, and both have their own reasons for dismantling Peel. Regional government and the Greenbelt are two things neither care about. Together, they could prove a most deadly power couple, just like the Macbeths.